What's Next: Facebook Shares Your Secrets: Facebook says it accidentally changed settings for 14 million users last month causing posts they may have thought were private to be public. "We recently found a bug that automatically suggested posting publicly when some people were creating their Facebook posts," Erin Egan, Facebook's Chief Privacy Officer, says. "We have fixed this issue and starting today we are letting everyone affected know and asking them to review any posts they made during that time. To be clear, this bug did not impact anything people had posted before -- and they could still choose their audience just as they always have. We'd like to apologize for this mistake." Facebook says it inadvertently created the issue while working on a new way for users to share items on their profiles. The Big Picture: Facebook isn't doing a great job of protecting user privacy even when it's not sharing their data with third parties. If there's a silver lining, it's that they're announcing this themselves and not waiting until they're exposed by the media. Welcome to PACIFIC. It never ends. Facebook's biggest problem is now the sheer number of its problems. The drip, drip, drip of scandal on myriad issues -- ranging from data privacy to foreign meddling to technical glitches -- threatens to overwhelm Facebook's costly, time-consuming effort to fix public perceptions and restore user trust. 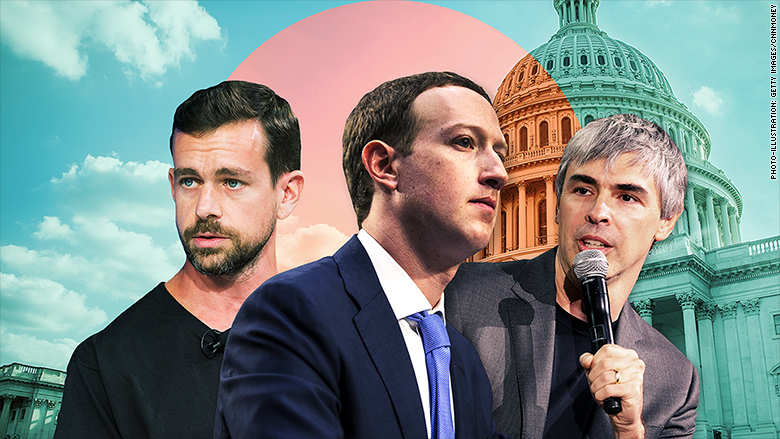 What's Next: The Senate Intelligence Committee will call on Facebook's Mark Zuckerberg, Alphabet/Google's Larry Page and Twitter's Jack Dorsey to address their data-sharing deals with Chinese device makers if and when they appear before Congress this summer, a Senate source tells me. • The pressure on the tech companies comes after Facebook acknowledged this week that it is sharing user data with Chinese companies -- including Huawei, which US intelligence agencies have called a security threat. • Sen. Mark Warner sent a letter to Alphabet today addressing "serious national security concerns" over Alphabet's data-sharing deals with Huawei, Xiaomi and Tencent. He also asked Twitter if they shared any data with the Chinese companies. • Sen. Richard Burr has said that the committee will invite the CEOs to appear before Congress this summer in conjunction with the committee's report on social media's role in Russia's election meddling. • The fine by EU's competition commissioner would be "the most significant regulatory intervention made against Google's business model." • "The commission is empowered to impose fines of up to $11 billion ... but typically decisions are at the lower end of the range." • The commission's battle with Google "began eight years ago with an investigation into comparison shopping ... that concluded with a €2.4 billion fine ... A third investigation is under way into whether the company unfairly banned competitors." The Big Picture: Europe is far more aggressive than the US about penalizing tech companies for bad behavior. And while financial penalties may not change that behavior, they certainly sting. As one tech executive told me earlier this week: "It doesn't feel good to lose billions of dollars, no matter how much money you have." "Commerce Secretary Wilbur Ross says the U.S. has struck a deal with Chinese telecom giant ZTE to end crippling American sanctions," CNBC reports. "The department says the deal includes a $1 billion penalty against ZTE and a U.S.-chosen compliance team to be embedded at the company." The Big Picture: Ten years after the financial crisis, Silicon Valley has replaced Wall Street as the place for elite business talent. In 2008, 20% of business school graduates worked in finance and 12% worked in tech, according to the Graduate Management Admission Council .... Today, 13% of MBAs work in finance and 17% work in tech. • "As [Washington] tightened regulations for banks and reined in executive pay, companies like Amazon, Google, Facebook, Netflix and Microsoft were pitching a new experience to top talent: Come work for us and transform the world." • "Top banks are aware of perceptions about their sweatshop culture. ... [they] have made efforts to cut weekend hours, but small tweaks are unlikely to pose a serious threat to the quality of life tech companies can present." • One investment banker who left Goldman for Google now gets free gym access, food and transportation. "At Goldman," he says, "there was a water fountain and coffee." • David Solomon, Goldman's presumed next chief executive, says Wall Street needs "to create an atmosphere where people can work hard, but they also have opportunities to have a life, to play hard and to have some balance in all of that." What's Next: Revenge of the Nerds: Tech companies are now playing by their own rules and circumventing Wall Street with IPOs that either go direct to buyer (Spotify) or withhold voting rights from shareholders (Snap). What the future looks like: Microsoft has successfully placed a shipping-container-sized datacenter with 864 servers on the seafloor off the Orkney Islands in Scotland. It is the latest milestone in Microsoft's effort "to develop self-sufficient underwater datacenters that can deliver lightning-quick cloud services to coastal cities." • "The US company will exclusively show all 10 matches over one bank holiday and another 10 during one midweek fixture program, for three seasons from 2019." • "The value of the deal was not disclosed." The Big Picture: "It is the first time packages of livestreaming matches have been offered by the Premier League ... [which has] been seeking to lure a deep-pocketed technology company such as Amazon, Facebook, YouTube or Netflix to help continue to drive up earnings from media rights." How you'll watch it: Amazon has also introduced Fire TV Cube, a streaming TV device with Alexa that can change the channel without a remote. My colleague Jordan Valinsky has the full report. Tongues are wagging after media analyst Rich Greenfield told Cheddar that Rupert Murdoch is no longer set on selling 21st Century Fox's assets to Disney in exchange for stock, giving a new opening to Comcast. • All things being equal, Murdoch would rather go with Disney than Comcast. • Comcast's Brian Roberts offered north of $60 billion in cash -- at least 15% more than what Disney offered in stock -- precisely because he knows that his offer needs to be one Murdoch can't refuse. • Disney's Bob Iger knows he's not going to get Fox for $52.4 billion in stock if Comcast is offering $60 billion in cash, and will therefore offer more or go home. In other words, we don't really understand what's changed. What's Next: The AT&T decision is five days away. What Next: High cuisine. GQ's resident food authority, Marian Bull, goes on a journey into a wild new world of gastronomy: the California edibles community.